Far Away and Long Ago is a very personal piece as with all my work. Like a personal album of memories. The journey started in an actual journey, this time Berlin, Germany. My friend took me to see the Stalin war monument, from which you can only see the mother because at the point of recording the sculptures, my camera run out of battery, just at the moment when the tree leaves are opening with the wind at minute 1.12. 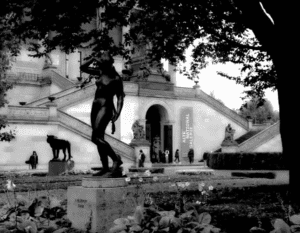 The rest of the footage was recorded outside a museum in Berlin and its centric whereabouts. When I came back to the UK and uncovered the footage I was very pleased with it as it looked very emotional. This emotion and the symbolism of motherhood that it evokes, made me play with the images in a certain order, which became a very long videopoem in the draft version. Also the piece had turned long because the music that I wanted to play was Pathethique, the last symphony by Tchaikovsky. I took this first draft to my first poetry film workshop which was being run by Helen Dewbery and Chaucer Cameron in Bristol. I was inspired by the workshop and I also received some feedback from Helen suggesting that it didn’t help that the duration of the piece was so long. I took it home and worked further on it. It was essential that the song was part of the piece, for various personal reasons. 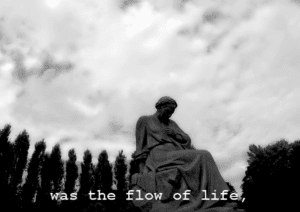 Thus, I made it silent and added the exact section of the 2nd movement of Pathethique which is very emotional, at the end of the Video-poem, so that it would increase the feelings awoken by the video-poem. With regards to the text, I used the subtitles option on Times New Roman. I played again with the whiteness of the footage to provoke emotion and the darkness of strong sad feelings. 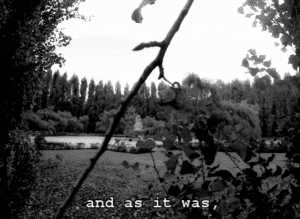 The poem in itself is a reused text of the epilogue of a novel I’m writing, but it had to be simplified for the purpose of the video poem. And it came to me during the process of putting the footage together. The footage was recorded with a GoPro and an iPhone 4S. It has been published in Datableed Magazine.